Dozens of anti-war activists have held a demonstration in front of the White House to condemn the US role in the Libya war. The protesters cite reports by the Libyan health minister, who says that over 700 people have been killed and more than 4,000 wounded in the NATO attacks, the Press TV correspondent in Washington reported on Saturday. “Foreign intervention and bombing does not bring peace, nor democracy, nor freedom to any people. It kills many innocent civilians,” said a demonstrator. “Since when did NATO show that it cares for all refugees? Look at Iraq, look at Afghanistan, look at Palestine. For years Palestinians have been suffering under terrible oppression,” the protester added. 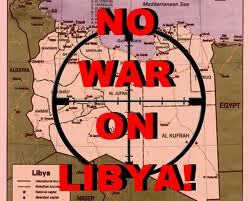 A smaller group of counter-protesters, who agreed that too much bloodshed has occurred in Libya, blame Muammar Gaddafi.